Our Club Nursery continues every Saturday from 9.30 to 11.00. All 4 to 7 year olds welcome. Just pop down and join in the fun. Thank you to Sherry Fitzgerald for their sponsorship. Mid-Term advanced camp for 13 to 16 year old boys and girls from 30th October to 1st November. Click on the MIDTERM CAMP button on the website for details and to sign up. Level 1/Award 1 Coaching Course Friday 30th November 7pm - 10pm, Saturday 1st December 10am - 4pm, Friday 7th December 7-10pm, Saturday 8th December 10-4pm, Contact @BarryMullane1 or barry.mullane.gpo.dublin@gaa.ie to book your place. Congratulations to Eoin Kennedy and Carl Browne who had a comprehensive win in the Senior Doubles Semi-final against Gavin Buggy and Tommy Hynes, winning 21-3, 21-8. They will now face Meath pairing Brian Carroll and Gary McConnell in the All-Ireland final on Saturday 27th October in Croke Park. Well done to the Intermediate 1 Camogie team who won their Shield Final, 3-05 to 1-09 against St Peregrines. Team spirit and a great work rate was in evidence and the players pushed hard to earn a great win. Well done to the players and to Aodh and Anne. Match report now on website! Congrats to both our Minor Hurling teams who qualified for their respective Championship Quarter Finals. AFL7 Footballers also recorded a great 1-09 to 1-08 league win over Ballinteer St Johns. 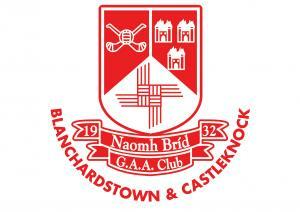 Minor Football Quarter Finals this weekend, A team is home to Naomh Mearnog at 11, B team away to Ballyboden. Junior hurlers have home quarter final and play Naomh Mearnog at 12.00 on Sunday while AHL4 have their final league game on Saturday in Russell Park at 4.30pm. U13 Ladies football play Cup final on Saturday and meet Clontarf. Thank you to everyone who supports St Brigid’s Club Lotto and to our great Lotto Committee. There was no Lotto Jackpot winner last week. Our next Lotto draw is in the Roselawn Inn on Thursday 18th October when the Jackpot will be €7,400. All in St Brigid’s would like to extend our sympathy to the Hilliard family following the passing of Brendan Hilliard.